Although he was not a religious man himself, the Rationalistic work of H.P. 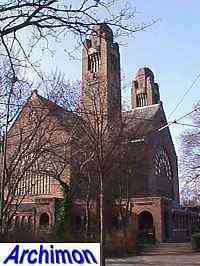 Berlage was a great influence for church architecture. Especially his commodities exchange in Amsterdam caused a true architectural revolution. The first to follow his example were the various protestant denominations. The Roman-Catholics later followed suit in the form of the Delft School of Traditionalist architecture. Protestant Rationalism however often shows influences of Jugendstil as well, although in a moderate form and in details like spires and ironworks only, as well as in the interior. Despite these influences, this style of protestant architecture usually is simply called Rationalism as well, while other sources simply refer to it as Jugendstil. The most important church in this style was probably the Koninginnekerk in Rotterdam which was unfortunately demolished in 1972. This church was also clearly influenced by Jos Cuypers' St. Bavo's cathedral in Haarlem, evidence that architects of the various denominations could respect eachother, much unlike the average believers and their leaders who were in a permanent state of cold war. In the 1920's influences of Amsterdam School Expressionism gradually replaced Rationalism as the favoured protestant style of architecture. 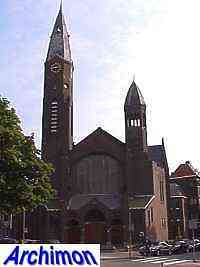 Especially the "Gereformeerde Kerk" built many churches in Rationalistic style. A former pupil of Berlage was Tj. Kuipers, who would become one of the most important of protestant architects and the most important architect of protestant Rationalism. One of Berlage's lessons he understood well is that the shape of a building should be determined by its groundplan. Several of Kuipers' churches were built at the corner of two streets, almost completely covering all of the available space, like the Gereformeerde Bergsingelkerk in Rotterdam, built in 1914-1915. The Nieuwe Badkapel ("New bath chapel") in Scheveningen dates from 1915-1916 and was designed by W.Ch. Kuijpers, a relatively unknown architect. The building, built for the 'Hervormde Kerk', is shaped like a Greek cross, consisting of four similar arms in Rationalistic style, with in the front corners two towers with Jugenstil spires. The big windows clearly remind of the neo-Renaissance style. 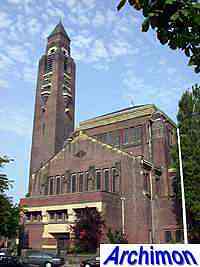 One of the last churches built in Rationalistic style is the reformed Julianakerk in Den Haag, designed by G. van Hoogevest and built 1924-1926. Here the Jugendstil is almost completely absent, only the tower still shows some influences. The rest of the building is almost pure Berlagian style.